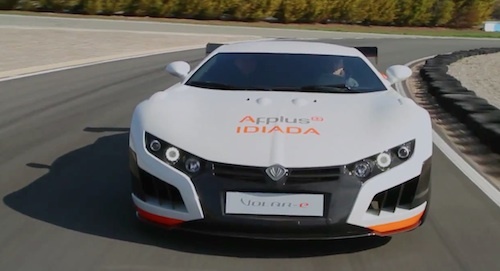 Spanish engineering firm Applus+IDIADA just demonstrated a wicked fast electric race car near Barcelona at the Circuit de Catalunya during the F1 Test Days. The VOLAR-E is a custom built electric race car sporting four electric motors, 1000 horsepower, 1000 nM torque, and specs, design and look that's suspiciously similar to the Rimac Concept One electric supercar. Going by the comments on both the YouTube video and Applus' Facebook page there may be a little bit of cross border rivalry going between Rimac fans and Applus. The specs are:- 4x electric motors, 1000 horsepower, 1000 nM torque, 640 volt 38 kilowatt-hour battery pack, a DC fast charge system capable of a 15 minute recharge, a fancy touch panel control system in the cockpit, four driving modes, a torque vectoring system, vehicle dynamics control, etc. The 0-60 time is 3.4 seconds. Comparing these specs to the Rimac Concept One, well, let's just say these are very similarly spec'd cars. Applus got the contract from the European Union to build this car in October 2012. The purpose stated at the time was to "help overcome the current technological and social barriers of electric cars and promote acceptance of electric vehicle technology by the public and the mass introduction of this type of vehicle into our society." In other words - by building such a car the EU wants to blow up the "slow boring ugly golf cart" stereotype. Going by postings on Applus' Facebook page there isn't much doubt that Rimac had a huge hand in building this car. A video of the workshop clearly has a Rimac logo on the wall, and a post covering the battery pack design shows battery modules from Rimac. By the way - the battery pack is made of 10 modules, each are 60 cells in a 20S3P (3 parallel'd cells, with 20 in series) for 64 volts 60 amp-hours per module. That equates to the 640 volts overall system voltage. The battery chemistry is lithium-iron-phosphate which is a curious choice for a performance vehicle. Other than the little controversy over who actually built the VOLAR-E, going by the video it does the job of blowing up stereotypes.